This year's celebrity line-up for the BBC show Strictly Come Dancing - in which those in America know it better as the format they took and re-named Dancing with the Stars - had Danny John-Jules among 14 others taking to the dancefloor with a professional partner, aiming to impress in ballroom and Latin dance disciplines. Most people know him as the Cat from Red Dwarf, but for me, he portrayed Gex in the UK dub for Deep Cover Gecko - and that was a huge deal for me to sketch the character out 2 days before the show's first elimination! Obviously this outfit is loosely based on the disco outfit he wore in the Rezopolis level in Enter the Gecko, which is already a homage to John Travolta's flashy white outfit in Saturday Night Fever - but I wanted to make it feel more like a suit rather than relying on 90s polygons...! As for Danny's progress in the competition - as of posting the image, he's among the 10 remaining celebrities, and even got the series' first 10 from one of the judges after doing a fun aviator themed jive in week 5! I'm wishing him all the best! 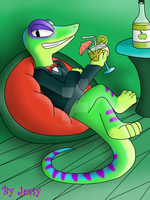 Gex is a platforming franchise created by Crystal Dynamics, with the IP now belonging to Square Enix for some reason. I drew this! "S'cuse Me While I Tail-Whip This Guy!!" He actually saw the original sketch when I put it out on Twitter!